To provide unbiased and judicious dispute resolution services in accordance with the State of California Superior Courts, while empowering and encouraging the community in gaining court access through mediation services. Every year, Mediation Services provided by Better Business Bureau® Serving Central California & Inland Empire helps thousands of people resolve tough problems without going to court—or giving in. Mediation Services staff and volunteers are trained to help people resolve problems and settle disputes in several ways. Many conflicts arise because people aren’t communicating at all. Our mediators spend a lot of time coaching people on how to negotiate effectively on their own, because that’s by far the best way to deal with problems. A little advice and encouragement from a dispute resolution specialist may be all it takes. If it’s too late for that, a member of our staff can often conciliate a settlement with a couple of letters or phone calls. Mediation Services serves Inyo, Fresno, Madera, Mariposa, Mono, Kings, Kern, Tulare, Riverside, San Bernardino, and Solano counties. *Fees must be paid prior to the date and time of the mediation. *Cashier's checks, money orders or Credit Cards are accepted. Checks or money orders can be made payable to: Better Business Bureau. 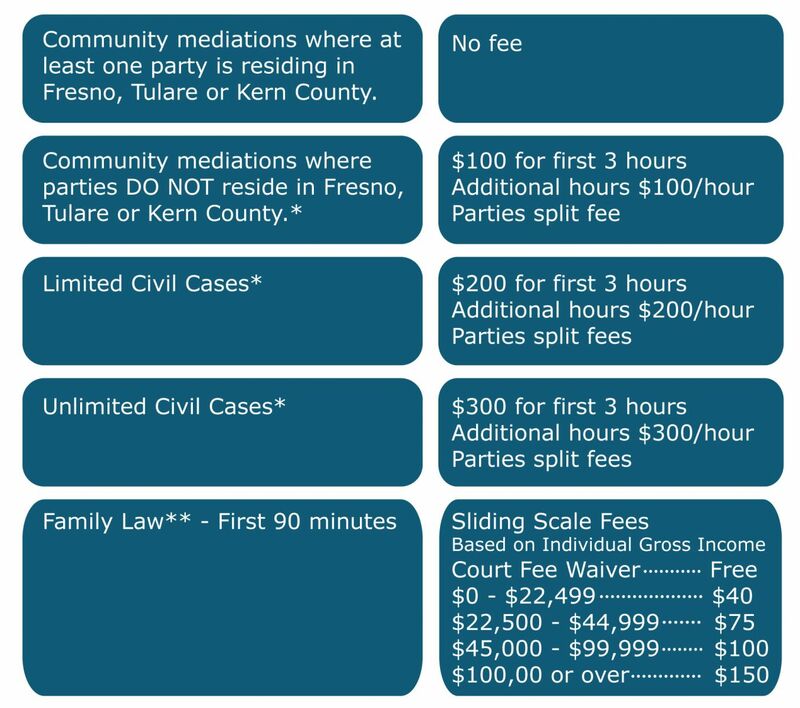 **As of: 07/01/2015 fees only apply to Fresno County. Copyright © 2006 - San Joaquin Valley Mediation, All Rights Reserved.